This is the first year in which Subway have brought out a Christmas special sub. It is described as a Festive Feast, and consists of turkey (which I guess we could see coming), sausage, bacon and cranberry sauce. 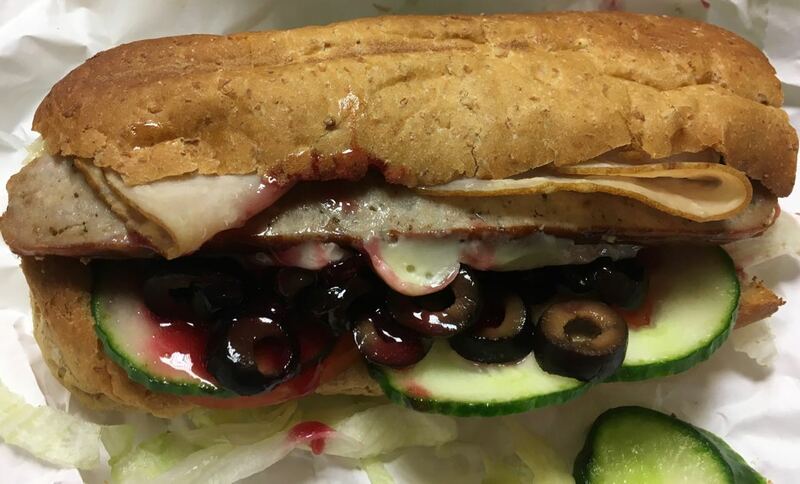 Of course when you order this sub you still get the usual offerings of salad, and I added lettuce, tomato, cucumber and olives… yes I know olives don’t sound like they’d go, but I was thrown by the already strange combination. This sub needed gravy, not salad! The cranberry sauce looked very runny when it strewn across the filling, it also looked like a very bright shade of dark pink and not so appetising. I tucked into the large Festive Feast Sub and realised it was not for me. There is too much meat, and the mix of flavours just meant it felt heavy and mixed up. I know people have mini sausages wrapped in bacon with their turkey dinner, but pig pieces of bacon, a full sausage and turkey sandwich was jut too much in each mouthful. The salad seemed really out of place, although all the parts were fresh and crisp. As already stated I didn’t do myself any favours with the olives, but heck I have them on their chicken tikka! Now the major problem I had with the Festive Feast Sub was not just the overload of meat, it was the cranberry sauce. It wasn’t very sweet and seemed more acidic and vinegary. Not a flavour I wanted in an already over complex sandwich. Did I mention it was runny, it was running down my fingers, by the end of the sub I wanted to take a bath, but had to suffice with washing my bright pink fingers in the sink at work. Next ones a Big Beef Melt. In the picture: it is "not toasted"?